Our building is often a topic of discussion when we have new visitors or clients, and we are always happy to talk to them about the history of the building and its architect. We take great pride in our work here at ps:studios and part of that is due to the environment that inspires us everyday. 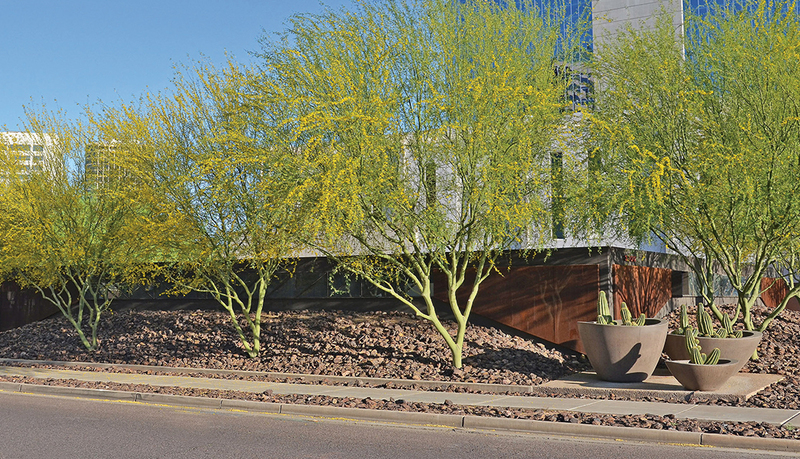 We have a great connection, both in our work and our lives, to the architectural community here in the valley, so imagine our excitement when we learned that Al Beadle’s vision still continues beyond the Phoenix area. Read more in the original article below published in Palm Springs Life. A Midcentury Master Finally Finds His Way to Palm Springs. Patrick House, Scottsdale, Arizona, 1973. Al Beadle moved to Phoenix in 1951 when it was still largely agricultural. However, he realized it was poised for a residential building boom and set himself up as a one-man shop. IT’S NO SECRET THAT PALM SPRINGS IS A MECCA FOR 20TH-CENTURY MODERNIST ARCHITECTURE, AS INDICATED BY THE HORDES OF DESIGN AFICIONADOS WHO HEAD TO MODERNISM WEEK EVERY WINTER. THEY CAN REVEL IN BUILDINGS, MOSTLY RESIDENTIAL, BY A PANTHEON OF ARCHITECTURAL GODS: RICHARD NEUTRA, ALBERT FREY, DONALD WEXLER, A. QUINCY JONES, WILLIAM F. CODY, AND WILLIAM KRISEL, TO NAME JUST A FEW. 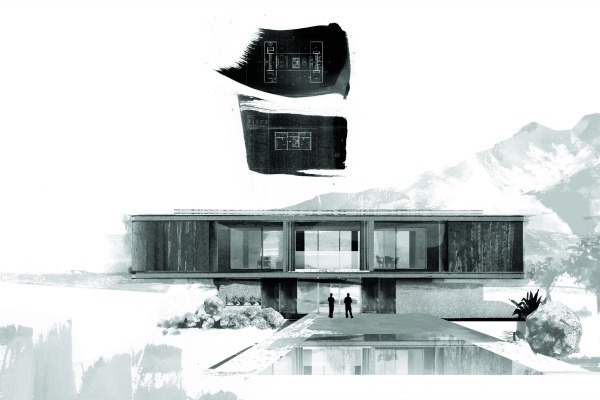 BUT ONE NOTABLE ARCHITECT WHOSE WORK NEVER MADE IT TO PALM SPRINGS WAS ALFRED NEWMAN BEADLE. Based in Phoenix, Beadle (1927-1998) gained fame in Arizona for houses, commercial structures such as the IBEW Building, and apartment buildings like the Executive Towers, all of which translated the rigorous, steel-and-glass vocabulary of modern masters like Mies van der Rohe into a warmer, more relaxed — but no less elegant — desert idiom. 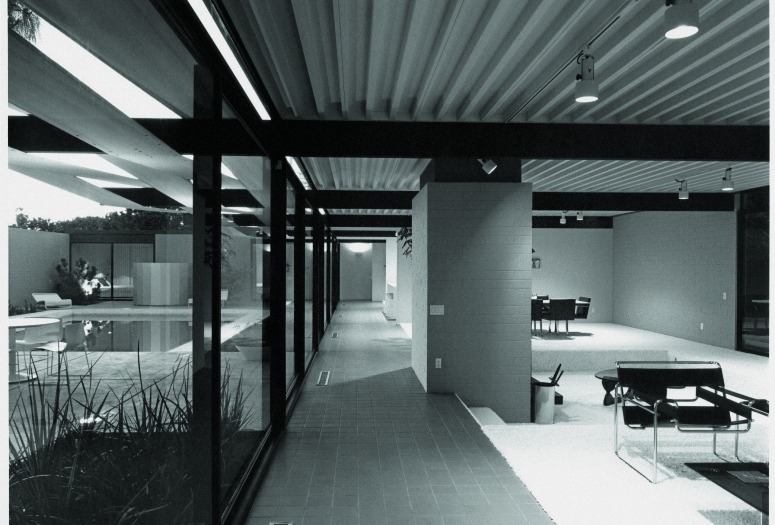 Beadle’s 1963 Triad Apartments, a clean-lined complex that is perhaps his best-known work, is the only dwelling in the legendary Case Study program located outside California. So it’s good news that one of Beadle’s house designs is near completion in the Desert Palisades subdivision, in the Chino Cone area at the foot of the San Jacinto Mountains. 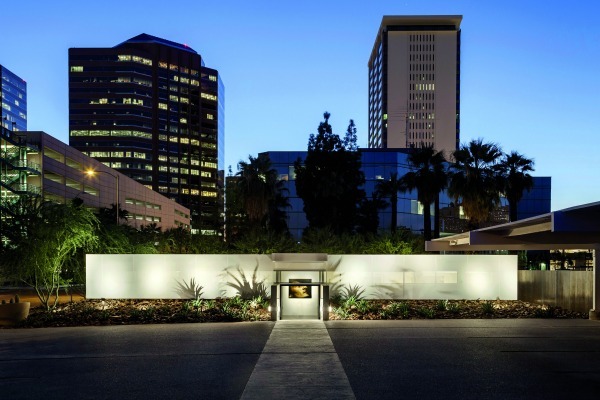 It was developed and built by Mike Yakovich, the owner of the construction firm Better Built Inc., with Palm Springs–based Lance O’Donnell as project architect and Ned Sawyer, a Scottsdale architect who worked with Al Beadle for 10 years in the 1960s and ’70s, as a consultant. designed house in Palm Springs that was featured at Modernism Week last year — was at the house when he met Scottsdale realtor Patrick Rice, who urged him to “come to Phoenix and see Al Beadle’s work.” Yakovich was “more than intrigued” by Beadle’s houses — sleek, simple boxes that sit lightly in their desert settings. He had already approached O’Donnell about collaborating on a development project, and O’Donnell had suggested Desert Palisades. “A light went on in my head,” Yakovich recalls. 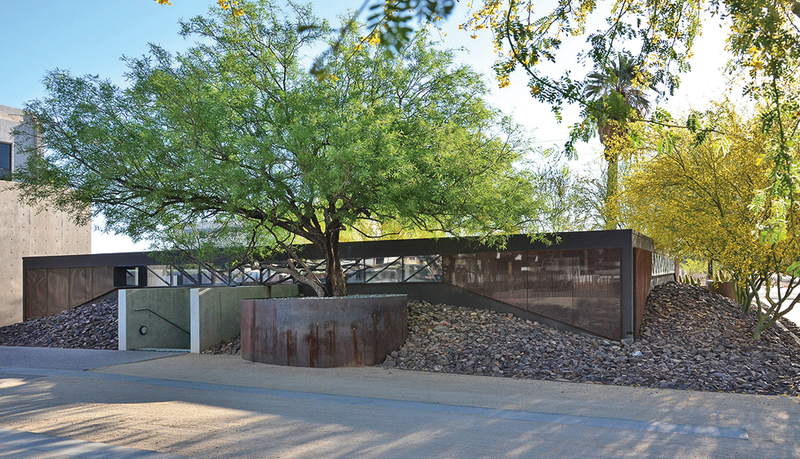 “This was the perfect place for an Al Beadle house.” In addition to working on the Beadle project, O’Donnell — who was also involved in last year’s Wexler project — designed and built a house on another lot in Desert Palisades. Here, Al Beadle poses in front of the “Hawk’s Nest” Novak residence, North Phoenix, 1994. The former Navy Seabee was known to be tough-minded and impatient with anyone who did not share his design vision. By sheer coincidence, Yakovich met Claudio Vekstein — a professor of architecture at Arizona State University, where the Beadle archives reside — in Palm Springs, and invited him back for Modernism Week. Vekstein, a native of Argentina who lives in Beadle’s Executive Towers, and who has long admired what he describes as “the innovative communal facets” of Beadle’s housing and his “authentic and eloquent” interpretation of modernism, was impressed by Yakovich’s “engaged approach” to modernist houses. When Yakovich called Vekstein to say he was headed to Phoenix and wanted to see Beadle’s work, Vekstein took him on a tour. On the second visit, Vekstein introduced him to Nancy Beadle, the architect’s widow, who had run her husband’s office while raising five children. When Yakovich told her he wanted to build a Beadle house in Palm Springs, “she had a bit of a chuckle,” he recalls. Once she realized that Yakovich was serious, she gave him her blessing, and he asked Vekstein to comb through the Beadle archives for a suitable design. The one Vekstein chose was an unrealized plan from the mid-1970s for a house on a rocky hillside in Paradise Valley, Arizona. Vekstein describes it as “a very vigorous and expressive structure, not common in Beadle’s work.” When he showed it to Yakovich, Vekstein says, “Mike was convinced by the simplicity, abstract, blunt nature” of the design, which featured a sleek rectangular volume set on a pedestal-like ground floor. Nancy Beadle requested that Ned Sawyer consult on the project, since he had worked with her husband and was a friend of the family. As Nancy Beadle puts it, “Ned would know what Al wanted.” For his part, Sawyer was glad to be able to help realize this project four decades after it was designed. 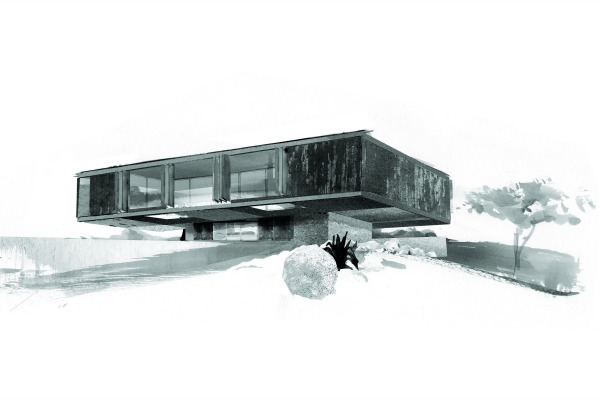 He feels it embodies “Al’s focus on simplicity” and the way the architect adapted modernist architecture to the desert’s harsh climate and rugged terrain. Mike Yakovich, Better Built, Inc. 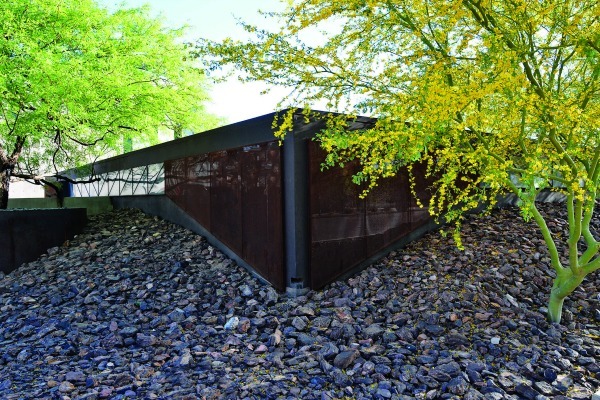 Even though the house, which cantilevers out 14 feet from its ground floor, was designed for a location in Arizona, Sawyer sees it as “a natural for the site Mike had,” since the landscape is similar to the original setting. 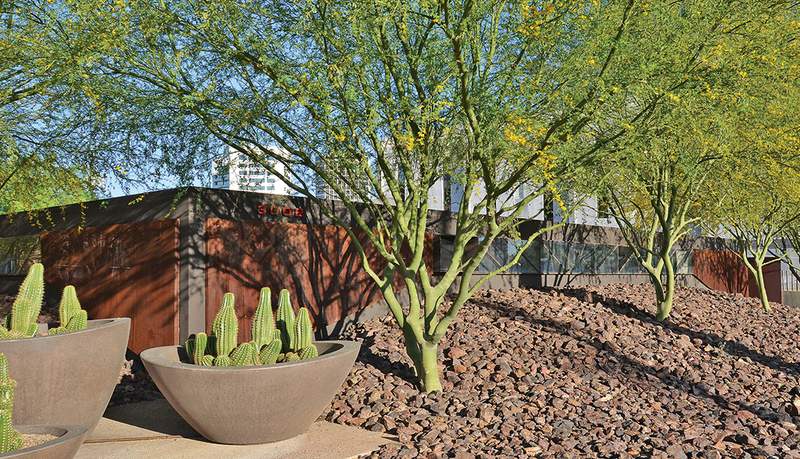 The house is true to Beadle’s concept, while incorporating ideas that are more in tune with the way people live today. On the main floor, with its central living-dining area and deep porches on either side, what was to have been an enclosed kitchen in a corner of the house has been opened to face the dining area. One end of the house contains a master suite, while the opposite end has another bedroom and bath and a study. The ground floor, which was originally designed to contain storage space, now boasts two more bedrooms and two-and-a-half baths. The spiral staircase that was supposed to connect the ground-floor entrance to the main floor no longer conformed to building codes, so a U-shaped stairway took its place. Perhaps the most striking alteration to the original design is the substitution of steel panels on the exterior for the plaster panels Beadle had envisioned. 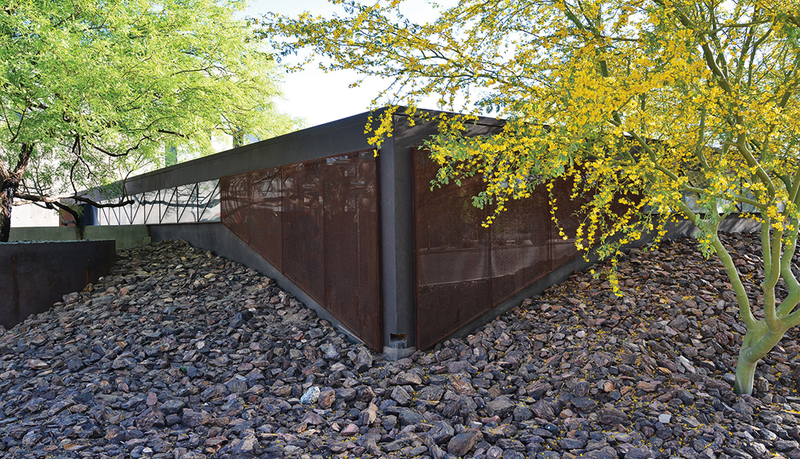 Yakovich is particularly enthusiastic about the change, because the rusty color of the steel “blends with the rocky hillside — it was the first material that came to mind. It’s not considered a typical Beadle material,” he notes, but, as Sawyer explains, it was one that Beadle had actually considered for this house. Sawyer adds that two sculptures by Beadle — one in rusted steel, the other with a powder-coated finish — will sit outside the house. 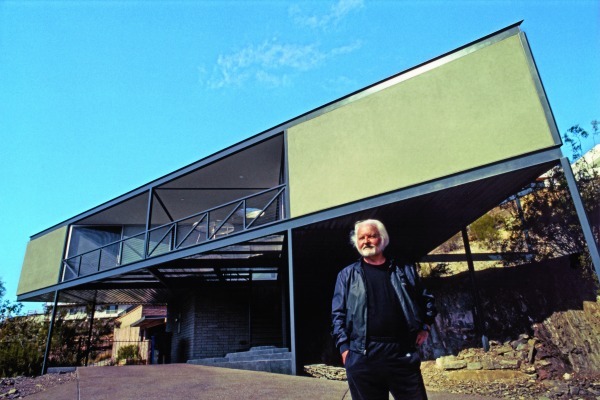 “Al started doing sculptures for his houses as part of his idea of total design,” Sawyer says, explaining that Beadle’s homes would sometimes be designed down to the furniture and door handles. 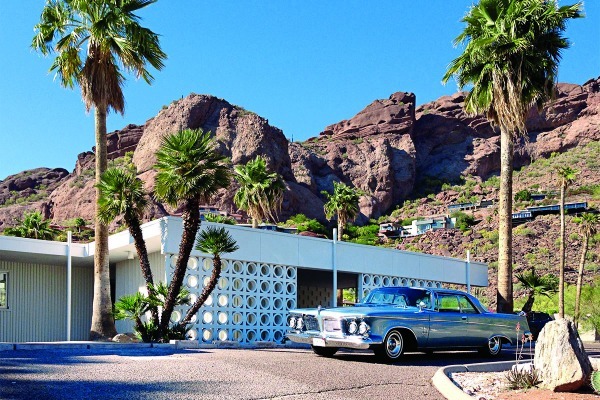 Tours of the Al Beadle home are being conducted daily during Modernism Week, February 16-26. For tickets, visit modernismweek.com. Although Yakovich built this house in order to sell it, he says he’ll still feel a pang when he parts with it. “This is a very personal project for me — this project is mine,” he says. 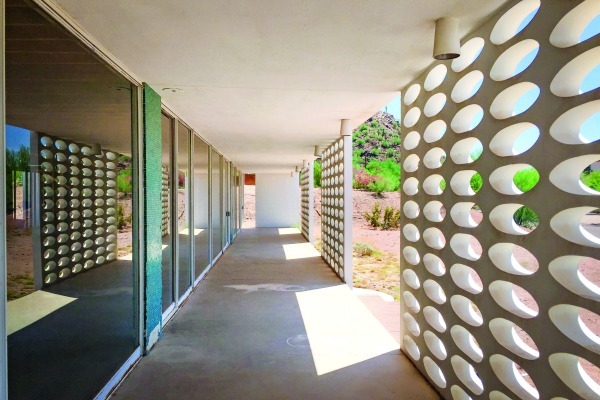 “Nothing’s been easy about this.” But his efforts, and those of O’Donnell, Sawyer, Vekstein, and everyone else involved, will add another landmark to Palm Springs’ storied architectural landscape. Beadle’s own architectural studio Midtown Phoenix, 1978.